A young child in China had a close shave with death after she fell down a gap in a train station platform onto busy tracks. 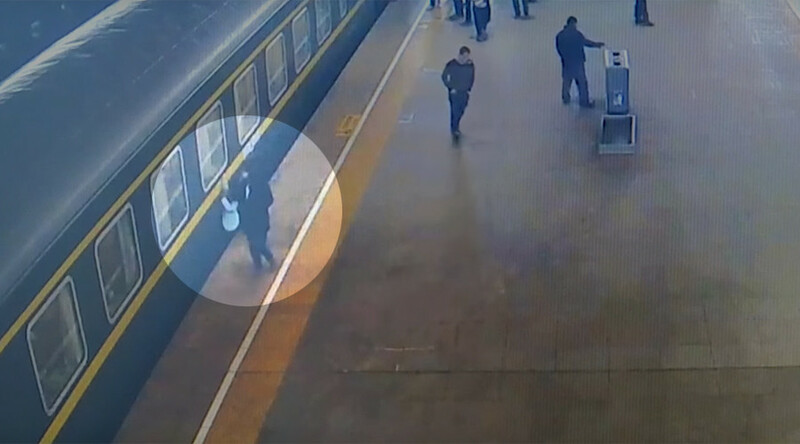 The 3-year-old was walking through Xining railway station in the Qinghai province accompanied by an adult, when she fell between an active train and the platform, CCTV News reported. Footage of the incident revealed how only moments earlier a commuter train had pulled up into the same section of track to pick up passengers before preparing to take off again. It appears the young girl had been attempting to peer in the side window of the train’s carriage when she made the potentially fatal slip. With the tiny girl trapped beside the locomotive, an accompanying adult desperately tries to free her while fellow travelers also rush to help. At one point a station security guard and other commuters appear to motion in an effort to ensure the train does not move. Eventually the girl is dragged from the tracks and back into the arms of a woman, who it turned out was her mother, China.org reported. Yin Changhai, a railway security officer, said the girl had a lucky escape. “When the train stops at the platform, the 20-centimeter-wide gap between the train and platform is very easy for children to fall into. “If it was not discovered immediately, the result would have been unimaginable,” he told CCTV News.